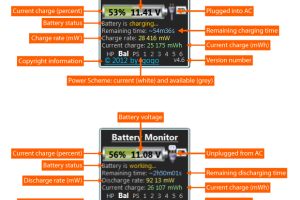 Real-time details and info about battery"
One of the worst things that can happen to you while you are working on your computer is your battery dying in the middle of something important. Situations like this slow you down. However, sometimes it is difficult to pay attention to our battery level and when it is time to charge our computer. Never go through this again with the help of this widget. Use this widget to keep control of your battery level. This unobtrusive tool allows you to check information regarding your battery while doing other tasks, as you can move the frame of information wherever you want. With battery monitor you not only have access to information like your battery status, but you can also know the remaining time of the battery, its charge rate, and more. And, don’t worry if you are running out of battery; you will receive a sound notification when this happens. If you desire to have more control, you can set two different alerts for critical levels. Change the sounds settings as you wish and don’t worry, you can always reset the original values. 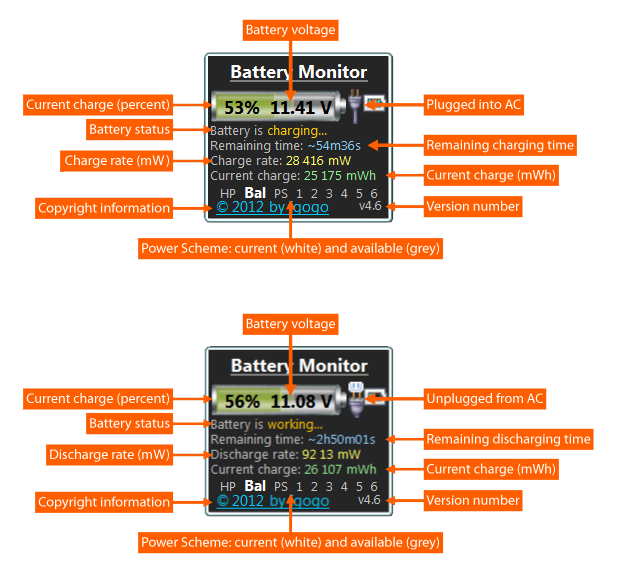 Battery Monitor is licensed as freeware for PC or laptop with Windows 32 bit and 64 bit operating system. It is in widgets category and is available to all software users as a free download. View the uptime of your ..
Real-time details and info about ..